A taxi driver was grabbed from behind before he was robbed of cash and his mobile phone. The victim picked up a man and woman from Hemel Hempstead railway station on Sunday, February 21 and was taking them to Crouchfield, Boxmoor between 11.40pm and 11.55pm. When they arrived at the destination, the male passenger – who was sitting behind the driver – grabbed him while the woman offender, who was sitting in the front passenger seat, took the victim’s mobile phone and cash from his pocket. They then got out of the car, which was a black Audi A6, and fled down an alleyway leading to Cornfields. Now Herts Police are appealing for any witnesses to come forward. The woman offender is described as white, aged around 30, slim with dark brown hair and 5ft 3in tall. She was wearing a dark coat and blue jeans. The man is described as white, aged around 35, of average build and around 6ft tall. He was clean shaven, has crooked teeth and was wearing a dark jacket and blue jeans. 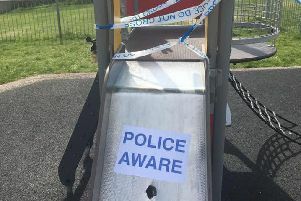 PC Laurence Harwood, who is investigating, said: “Thankfully the victim was not injured but it is important that we trace these offenders as soon as possible. Those with information should call PC Harwood on 101, quoting reference number D1/16/1366.